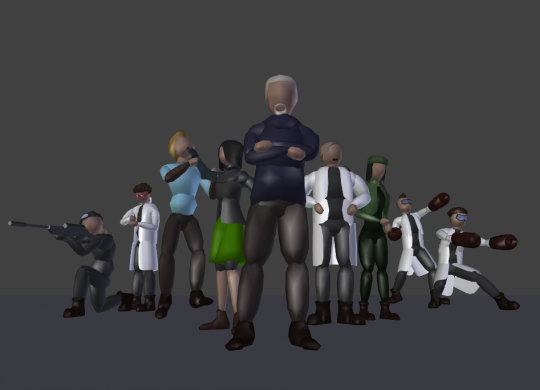 We’re starting to gear up for the animatic. With Ian getting the timing together with a storyboard edit, I’ve been rigigng up some low-poly, least-distracting, fast, quick and easy to use proxy characters I’ve affectionately named BlockHeads. The idea is to use these with low res environments to really plan out how each scene and shot will be done. Obviously we’ll probably tweak it all alot once we start the actual filming. But for now this will give us a really solid idea on how each shot should be planned, how when and where we need to add detail and also what the film itself is going to be like. Wow, that is awesome! :D Thank you so much! i’m gonna wait until you release the movie, i barely hold myself to peek around. great work guys… and it’ll be great if you share some planning, management and organization stuff. Wow, awesome! :D Thank you so much! Am I the only one, or does the guy in the front look like Ton…with a moustache, beard and grey hair?